Throw on your spurs—or whatever the most humane equivalent is—and toss a saddle over your favorite equine companion. And maybe throw a carrot or some sugar cubes in your pocket in case Lightning gets hungry on the way to the grand opening. That’s right, horsefolk, the Grand Opening of the Riding Warehouse is Saturday, May 11, from 10 a.m. to 4 p.m., and you’ll find music, raffles, and giveaways there. The Riding Warehouse offers an array of riding apparel, stable equipment, horse trailer gear, horse tack, and more for all riding styles. Heck, it’s not all about show and tell, though; they even have horse health supplies, like hoof care and heart-rate monitors. RIDING IN COMFORT : The Riding Warehouse has everything you need to ride in comfort and a staff happy to help with your selections. Owner Tracy Bailey is pictured with staff. The Riding Warehouse is co-owned by Tracy Bailey, Drew Nuster, and Mark Sczbecki. Bailey originally owned the Long Riders Gear, founded in 1996, which was strictly online ordering. But Nuster and Sczbecki decided they should open an actual warehouse. Together, they expanded and transitioned the Long Riders Gear into the Riding Warehouse and have a fantastic team to back them up. Their team, “the gals,” are experienced riders and are more than qualified to help each customer who comes through. Each of the gals goes by a first name and has her own style and experience: Julie is in charge of the website and marketing; Amanda is the customer service supervisor; Alexandra does customer service and order fulfillments; Marina does customer service and purchasing; and Brie is the buyer and also does customer service. 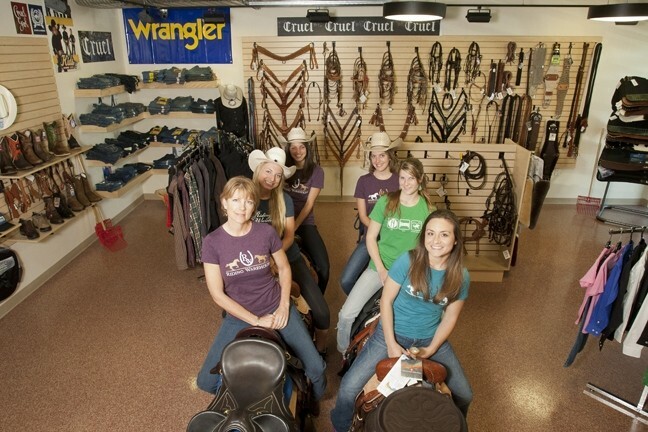 The Riding Warehouse is at 181 Suburban Road, near the Running and Tennis Warehouses in San Luis Obispo. And the grand opening will be a day full of fun with music, beverages, and snacks while they hold raffles, giveaways, and in-store discounts. The raffle and giveaways will include tack, Ariat boots, Professional’s Choice Ventech boots, Prestige bridles, Best Ever saddle pads, Troxel helmets, and more. And any item purchased in-store will have a 10 percent discount. The Riding Warehouse retail store is open Monday through Friday from 9 a.m. to 5:30 p.m., Saturday from 9 a.m. to 5 p.m., and Sunday from 10 a.m. to 4 p.m. Or they can be reached by phone Monday through Friday from 7 a.m. to 5:30 p.m. and Saturday from 9 a.m. to 5 p.m. They can also be found online at ridingwarehouse.com or on one of their three Facebook pages divided by the riding styles English, Western, and Endurance. Or they can be contacted by phone at 540-7908 or e-mail at info@ridingwarehouse.com. Intern Lareina Gamboa compiled this week’s Strokes & Plugs. Send your nonprofit and business news to strokes@newtimesslo.com.